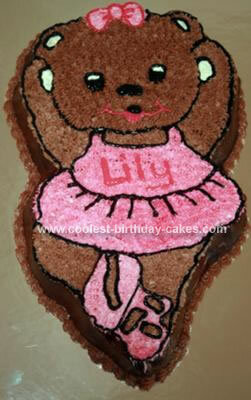 I got the idea for this Ballerina Bear Cake from the Wilton website. My daughter is very into ballet at the moment. The cake is 2 chocolate packet mixes. The cake is iced with a buttercream made with butter and vegetable shortening. I piped little stars all over the body and hand drew the features and outline.